At a distance of only 10-km from the famous Hindu pilgrimage Varanasi, after attaining Enlightenment the Buddha went to Sarnath. Lord Buddha had visited Sarnath looking for his five companions who abandoned him in Rajgir while they deviated from the viewpoint of Lord Buddha on self-mortification. 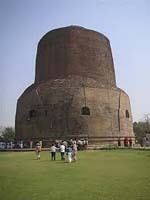 The stupa is the most impressive structure in Sarnath. Built around 500AD the excavations have revealed that some earlier construction was present at the site. The stupa is a place where one can see the devoted Buddhists circumambulating the structure, Ashoka might have built the stupa to earmark the Dharmachakrapravartana to five ascetics. By Rail : Varanasi is a major station in Broad gauge network, Varanasi Cantt. and Mughal Sarai (16 km, one of the main railway stations of Varanasi) are the important rail junctions, that link Varanasi with all major cities of India.